Find out more about mapping techniques and share your experiences! Welcome to the MAP-it website – a place to find out more about mapping techniques and share your experiences! In order to better understand how MAP-it works, we explain it all here. You can also check out a series of examples in our mapping reports section. Once you've seen how it all works, why not try it for yourself? 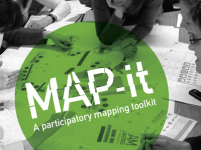 Follow these steps to create your own mapping sessions. And if you do, be nice and share your mapping story with us. We would love to receive some feedback/hear from you. Do you have any questions, suggestions or want to find out more about us and our other projects? Contact us.